For over two decades, USA Trophy has been providing Orange County businesses with beautiful, high quality executive and corporate awards to acknowledge a wide array of accomplishments and occasions. Whether for quarterly awards, end-of-the-year awards, special recognition awards, branch awards, or high-performance awards, we'll make sure you get the right award for your needs at a price that fits your budget. We've worked with numerous grocery stores, sales organizations, mortgage companies, real estate, management companies, solar companies, school districts, government entities, chamber of commerce, and other businesses over the years, and developed a reputation for providing exceptional customer service, fair prices, and fast turnaround. Crystal and Glass Awards - Make a statement by recognizing your award winner with a stunning crystal or glass award. These timeless awards come in a variety of sizes and shapes, including stars, prestige diamond, octagon, beveled peak, rectangle, and oval, and writing can be etched onto the surface to create a clean, laser-engraved frosted effect. Our crystal and glass awards are customized and engraved in-house under our owner's supervision to ensure the specific needs of each client are met. Acrylic Awards - Acrylic awards are popular for their crystal-like appearance and cost-effective price range. These corporate awards are the perfect way to recognize your employees while staying within budget. Piano Finish Plaques and Boards - Our beautiful piano finish boards and plaques are available in a selection of colors, including rosewood or black, and writing can be engraved into the board itself or onto an artistic/designer plate on top of the board or plaque. Piano finish boards and plaques make excellent keepsakes and individual awards. 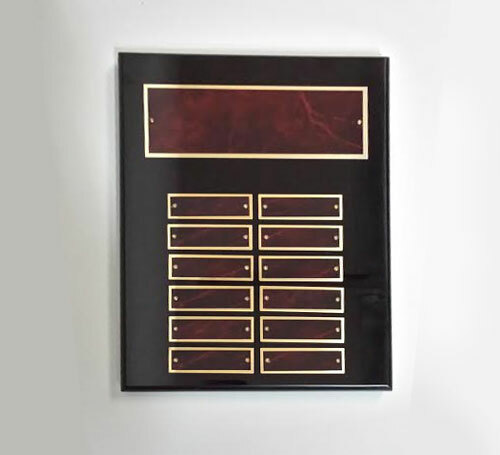 Perpetual Plaques - Perpetual plaques are designed to allow companies to continuously add names onto the award, making them ideal for recognizing multiple high-performing individuals year after year, such as teachers of the year, outstanding team members, high level donors, and more. Corporate Awards and Gifts - USA Trophy offers a variety of other popular corporate award options, such as an eagle or large metal cup on a marble or piano finish base, clocks, gavels, personalized pens, and more. Whether you know exactly what you want or need help making a decision, USA Trophy can help. No order is too big or too small, and we can work with most budgets. Our Laguna Hills showroom is open Monday through Friday 12:00 p.m. - 8:00 p.m. and we can accommodate early, late, and weekend appointments on request. We are ALWAYS reachable by email, phone, and fax after hours. Give us a call today to learn more about our executive and corporate awards. USA Trophy is proud to be a member of the Awards and Recognitions Association.